Pronovias Fashion Group announces that its labels it will participate in the upcoming London Bridal Fashion Week - for an updated list of attending labels, check out the LBfw website. Pronovias Fashion Group announced that they will be participating in the upcoming London Bridal Fashion Week (LBfw) and will be showcasing their labels La Sposa, San Patrick, White One and Fiesta Pronovias latest collections. The LBfw is one of the greatest platforms for preeminent wedding dress designers to reveal what they´ve been working on for the upcoming season to both a domestic and world-wide market. La Sposa is the third label launched by Pronovias and came into being in 1997. Since then it has been a has been as successful as its predecessors, the eponymous Pronovias and St. Patrick. 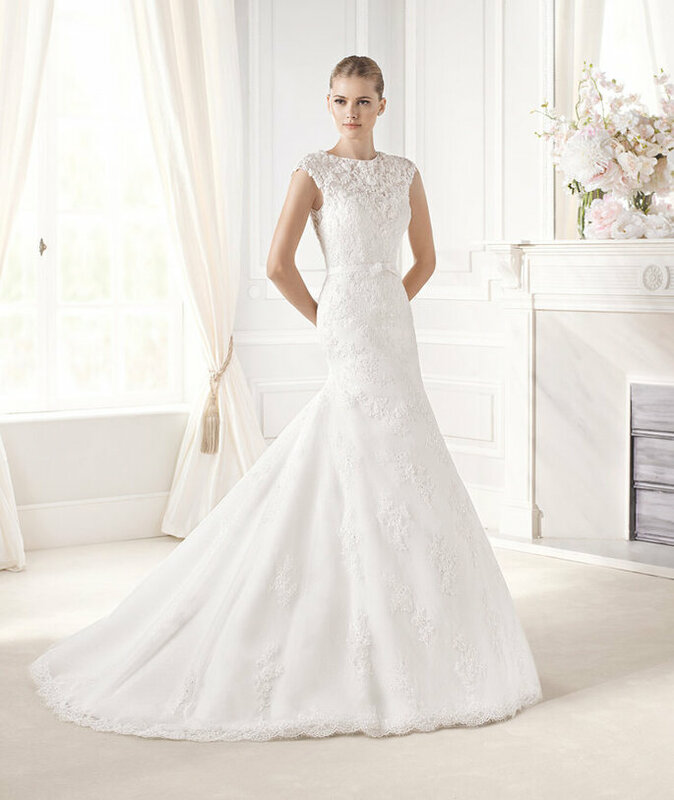 The firm has consistently showcased beautiful, classic wedding dresses that earn it many dedicated customers. The latest collection from La Sposa has a distinctly fairytale feel – brides will look like modern-day Cinderellas, in these romantic classic gowns. 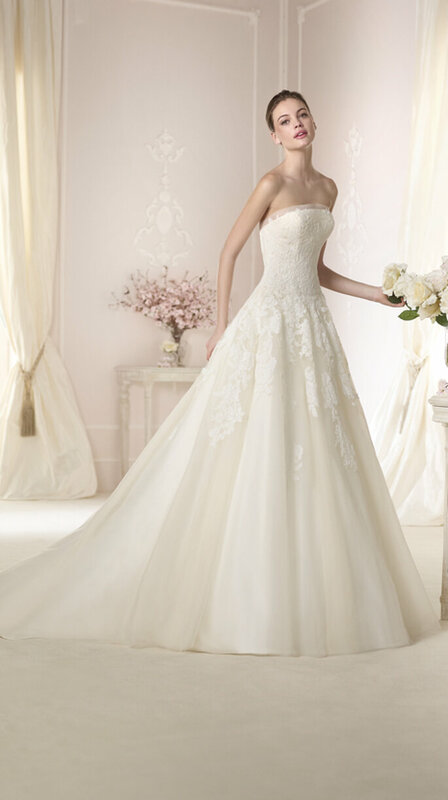 La Sposa specializes in full skirts with layers of tulle frills that cascade to the hem. Though, for more form, they also design beautiful figure-skimming mermaid dresses and though most necklines are higher, the plunging backs add a touch of sensuality. Siannan, St. Patrick. Credit: St. Patrick. Sabana, St. Patrick. Credit: St. Patrick. Big sister to La Sposa, St Patrick is a leading bridal label that has spent more than four decades dressing brides for their special day. This lasting power has earned the popular firm recognition in over 105 countries all over the world. The company is named after the famous cathedral on Fifth Avenue in New York City. The label designs elegant and sophisticated wedding dresses, focusing on subtle, sheer layering techniques and fine lengths of lace. In their latest collection, many of the dresses are tulle-based dresses featuring Chantilly, rebrodé lace, and gemstone embroidery. Of note are the gorgeous bodices with delicate mother-of-pearl beading. Danit, White One. Credit: White One. Daimi, White One. Credit: White One. This season White One presents a sweet collection with a sensual twist. Featuring original lace-up backs inspired by classic corsets, satin ribbons sensually crisscross the bride’s back, exentuating the waistline. On other dresses, rows of countless tiny buttons embellish the back from top to bottom. This season especially offers wonderful embroidery work with mother-of-pearl on Chantilly, gemstone embroidery and brooches on aged silver satin belts. These details help to delicately break away from the monopoly of white. Laisma, Cocktail Collction Pronovias. Credit: Pronovias. Laina, Cocktail Collction Pronovias. Credit: Pronovias. Lacia, Cocktail Collction Pronovias. Credit: Pronovias. The Cocktail Collection by Pronovias is designed for wedding guests as well as for guests of a wide range of cocktail parties, gala events, celebrations and ceremonies. This season, the silhouettes are clean are figure-hugging. Embellishments apprea in sculptural draping and painterly floral prints. Color plays a strong role in this latest collection – a rich, luminous palette of warm shades of red, coral, bougainvillea, lime and English rose, even daring colors such as royal peacock blue and purple. All the designers La Sponsa, San Patrick, The White One and The Cocktail Collection by Pronovias will showcase alongside an array of other bridal designers at the London Bridal Fashion Week on 17th-19th May 2015 in London’s iconic Old Billingsgate. For a full list of labels exhibiting, please visit www.londonbridalfashionweek.com.